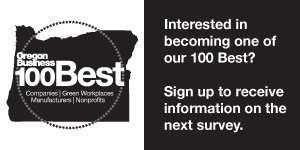 Oregon Business magazine’s seventh annual 100 Best Nonprofits to Work For project attracted more than 150 nonprofits from around the state from a variety of sectors, including social services and environmental advocacy. More than 5,000 employees and volunteers filled out the survey, rating their satisfaction with work environment, mission and goals, career development and learning, benefits and compensation, and management and communications. Here is the list of the 2015 100 Best Nonprofits to Work For in Oregon, including short profiles of new entrants to the list this year. Tim Murphy, executive director of Bridgeway Recovery Services, set the tone for the culture he wanted to create on the very first day this Salem-based drug rehab and addiction recovery center opened in 2009. Customer service and care are the center of this organization’s culture and mission. Every employee is conscious of how they are presenting themselves and interacting with others, says Renee Hancock, director of human resources. “We want this to be a place of refuge. Employees need to be conscious of how they are interacting,” says Hancock. The culture stresses transparency. All staffers take part in monthly meetings. When they first start at Bridgeway, employees go through an orientation on workplace culture and ethics boundaries. The organization took part in the survey for the first time this year because it wanted to recognize the good work and dedication employees have to its culture and mission.